They show up in places we’d never expect to find them. Sometimes they are dirty and mal-nourished, looking a bit afraid while at the same time trying to put on a brave face to show us just how cute they really are. Other times, they are front and center and quite showy. You wonder how you missed them, having walked by that spot so many times. It is as if they showed up overnight. Our temptation is to keep them. If they are in the right spot, we just let them keep on growing there. Or if they have good potential, we take these stray puppies, clean them up a bit and move them to a more suitable spot. Did I just write “stray puppies”? Oops, sorry about that. I meant “stray plants”. Apologies to friends and family who momentarily thought I had gotten a puppy. Ha ha. No dog. You all know better than that. I found a stray plant yesterday - out in the garden, looking all ragged and mal-nourished after the hot, dry summer, but blooming its best to convince me to keep it. And keep it, I shall. As it turns out, the flower is actually Helianthus x multiflorus ‘Sunshine Daydream’. The Hoosier Gardener wrote about it earlier in September and gave it high marks for its performance in her garden. She reminded me via email where I got mine. I also give 'Sunshine Daydream' high marks because of how it survived in my garden… forgotten, forlorn, forsaken, for goodness sakes, but determined to bloom. And bloom it did, enough to get my attention, to finally make me take notice of its potential to be a great plant. I’ve recommitted to it now and plan to move it to a better spot this week. And I promise to take care of it. Really, please, let me keep it! I promise to do better. I’ll water it and watch over it. Please. I promise! Oops, I forgot. It isn’t a puppy, it’s a plant. I still want to keep it… and now that I've found it, I can’t imagine my garden without it. Such a goregous color and texture. I like how full and fluffy it looks, I think I'll need to try this for next year. By fall, most of my plants are kaput, I'd love to have some of the energy in October that I do in my May-August flower beds. Ha! Carol, I DID think you'd gotten a dog! He's a cute model - is he Sherry's? Seems like I remember her having a Dachshund. I just posted about a similar topic - not strays, exactly, but plants without a forever home! HA, you are too funny, Carol! Both puppy and plant are keepers! 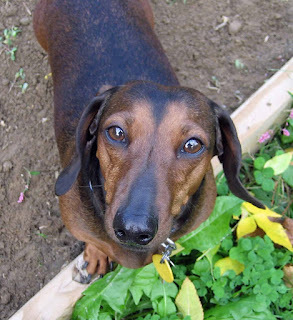 I know your post is about stray plants, but if you do keep the Dachshund watch it in the garden. They dig to rival one of your hoes. So it wasn't a dahlia! I think that's the Helianthus I got at GWA last year, the one that failed miserably in my garden. It's long since become compost. That is a sweet face in the first photo. It too would be hard to resist if I found it in my garden. I am laughing! I bring home stray plants but my Chief Engineer brings home stray puppies and now my little daughter brings home all manner of neighborhood frogs. 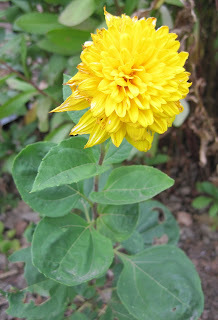 Cute blog -- and helianthus! Good to know! I was falling for that puppy. Such cute eyes. But nice to know you save plants too. That one has earned its keep! I found the tag for mine this spring, but no sign of the plant. I like it, though. I think I'll try it again, but in the spring. Okay, you got me on this one! When I retire from CTG, I plan to devote my energies to stray animals (which I already do)! Currently, I deal with stray plants, too. Coincidence on your post on helianthus since Texas Gardener just had a great story on their hybridizing to make this a SuperStar garden plant!